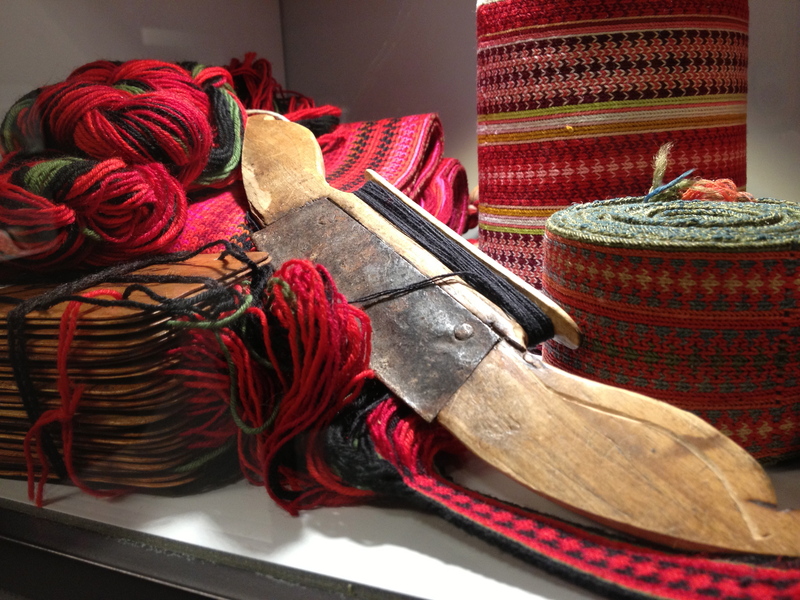 The 2013 Vesterheim Textile Tour traveled deep into Telemark, where culture and tradition are taken very seriously. It would not be difficult to spend $10,000 on a bunad, or national costume, of the region, given the textiles included and the massive amounts of silver in buttons or pins or chains. Silver was used to indicate wealth and status, and of course, to ward off underworld spirits. 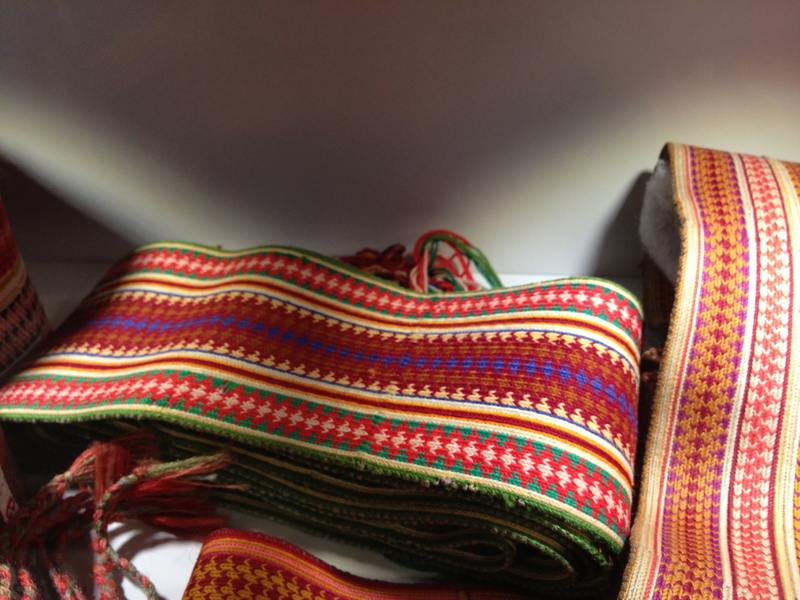 A costume element of particular interest to weavers is the wide, bright tablet-woven belt adorning the waist of a woman’s bunad. 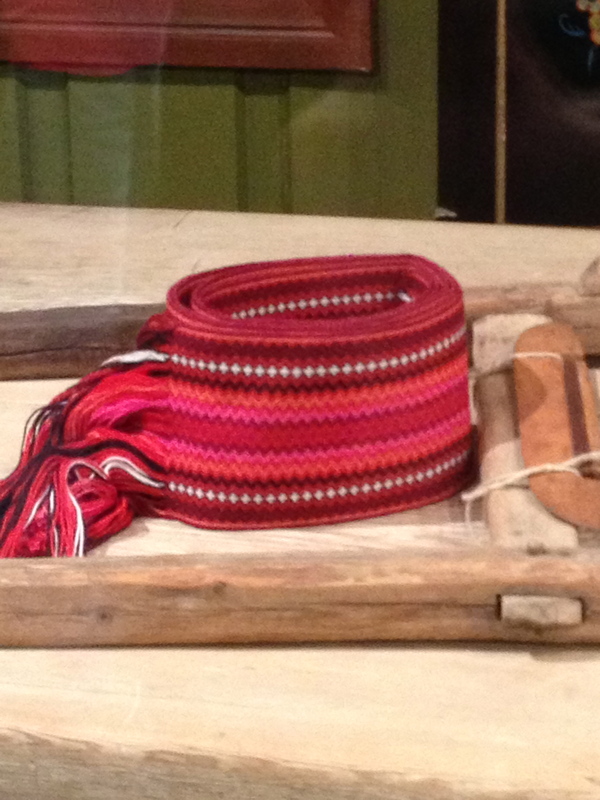 I have seen a few examples of these belts at Vesterheim. My friend Lila Nelson wove one once – the operative word being “one”; she said it was a difficult and lengthy process and she made it as a one-time experiment. 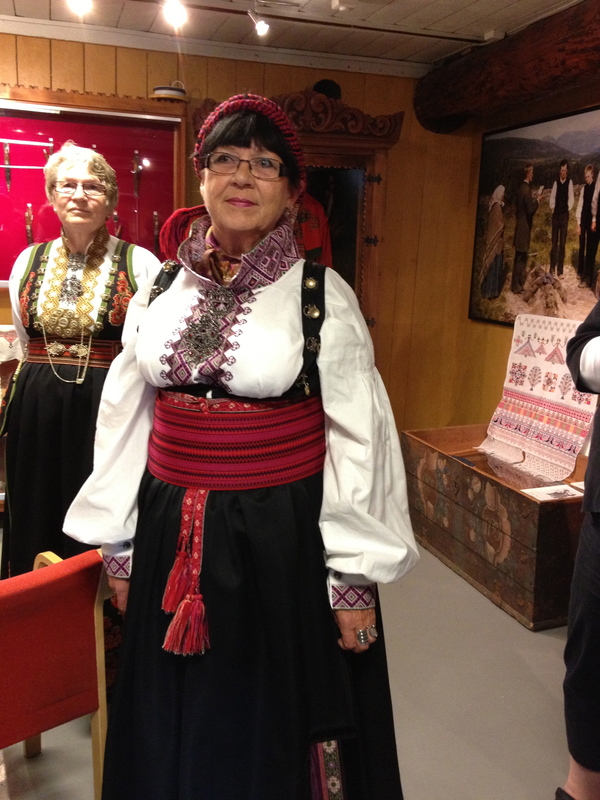 Suddenly, during our Telemark travel, the belts were everywhere – at the museums and brightening the costumes of women at Evju Bygedetun, a historic farm museum. At the Evju farm we ate a traditional meal of rømmegrøt and dried meat and toured the collections of textiles in the farm buildings. We were hosted by a group of women who gather each week to embroider. 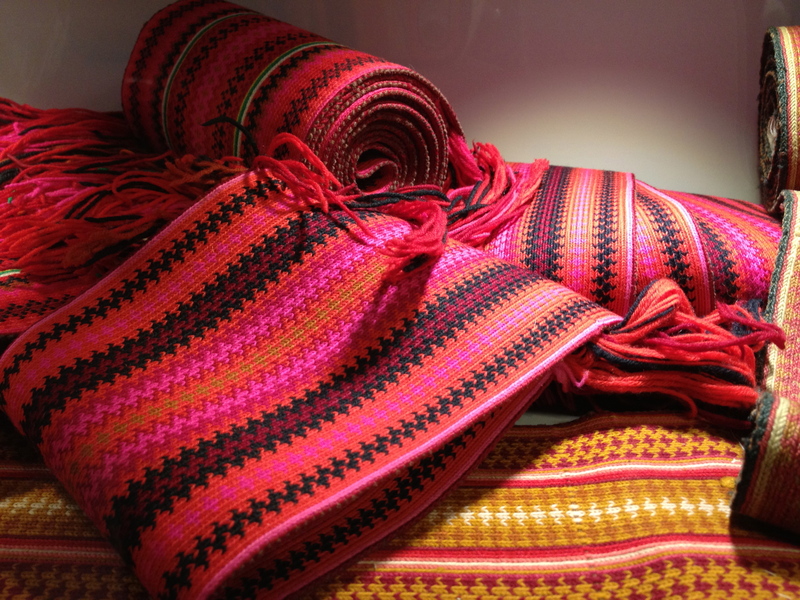 Using traditional techniques and patterns, they continue a textile heritage that stretches centuries before modern roads reached the valley and wifi connects visitors to the farm. I loved this woman’s belt. Her costume was very showy, with a spectacularly deep, richly embroidered collar. The pinks and reds of the belt were so striking, set off by the black of the skirt. I was told that since the early 1900s the belts became broader and broader (and more difficult to weave, I’m sure) until about the 1970s. Today one of these belts costs about $1000. 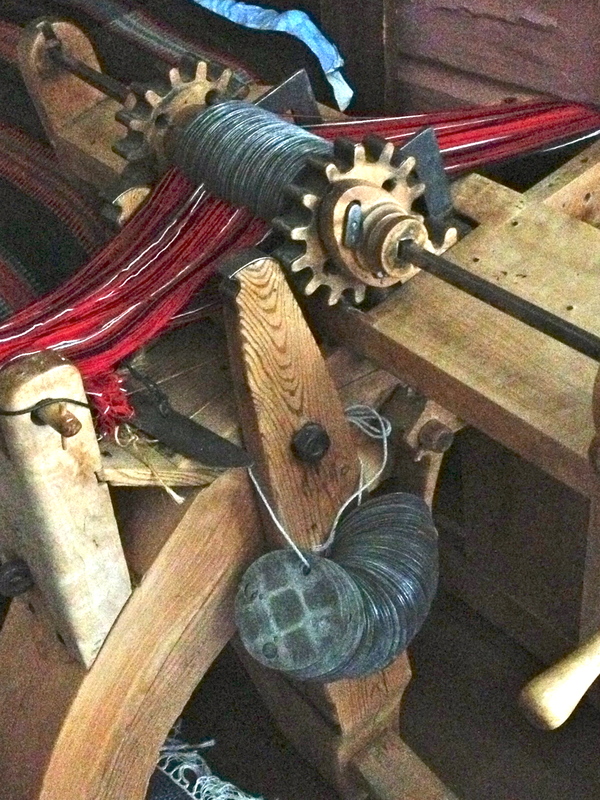 The Evju Farm included a small outbuilding used by a weaver, including an elaborate loom set up for weaving bands. Professor Mikkel Tinn said that people in the neighborhood were skeptical that the weaver – a woman, after all – could have come up with the complicated machine all on her own. 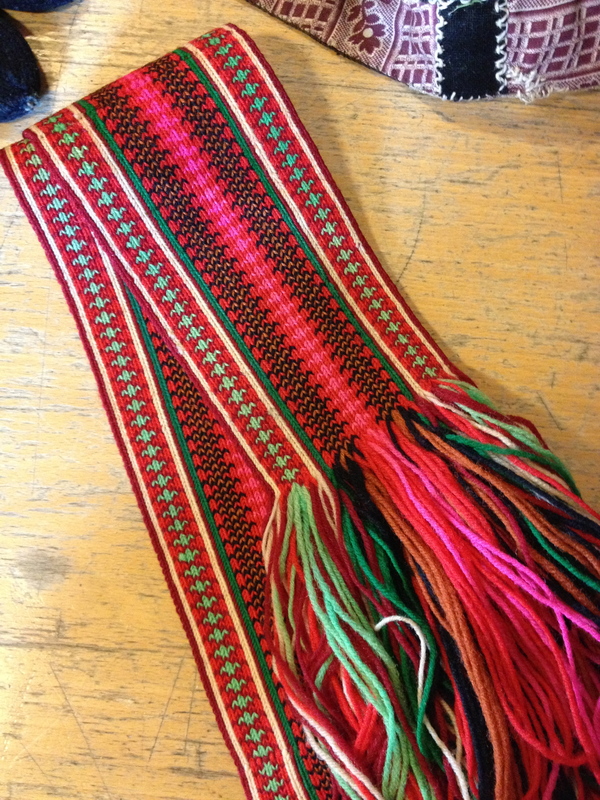 Some people wondered whether she might have a criminal background, since the prisons in Norway at the time included industrial programs – maybe that’s where she figured out the special band-weaving loom? Here are a few more Telemark belts I had the great fortune to see. 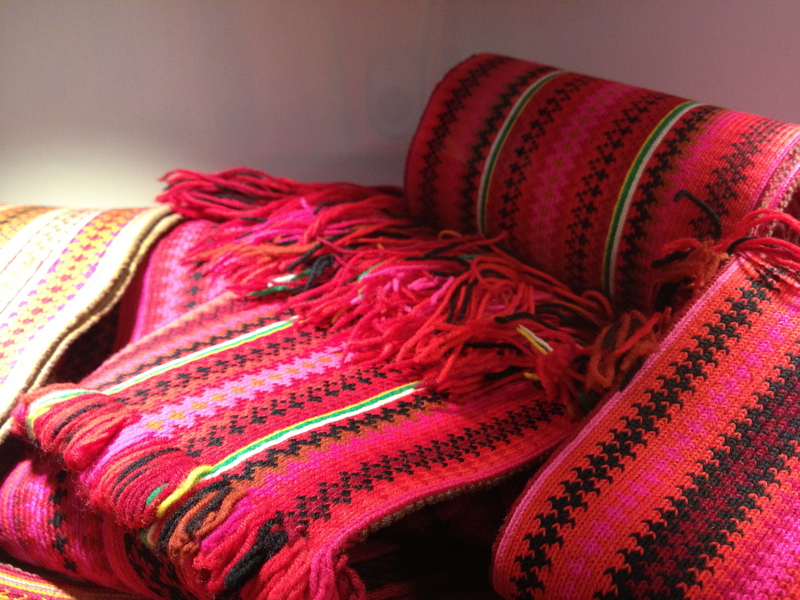 This one was woven by Helga Bergland. Here are other bands from the Bø Museum. And finally, here is a wonderful implement used in making bands, a wooden sword to beat in the yarn as the belt it woven. Stacked next to it are square cards which are used to manipulate the threads. The cards are turned in particular sequences after new thread are beaten in, forming the pattern.